There are choices to be made in every day, and it's simply not healthy to say yes to everything. 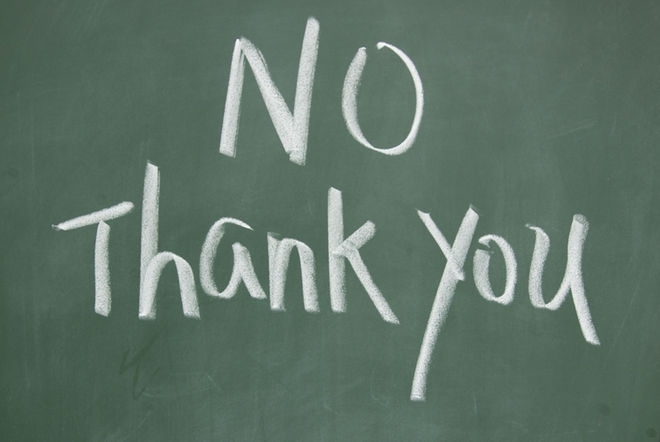 But it's universally accepted that there are good ways to say no, and there are ways that are simply awful. In relationships, and in interviews, game shows and dance schools, someone's going to be rejected, and there's a chance that it's not going to be pretty. I won't be around later, I'm doing something else. The other night was good but it was a one off, I'm not looking for anything. I remember the feeling when I read that message, the overwhelming desire to laugh out loud at the ridiculousness of it. I was not 'looking for anything' either, but he chose that as his excuse for being appalling. The anger that someone who could behave that way had rejected me, instead of the other way round. The hurt that I was not 'good enough' in his eyes, the gnawing feeling of my own potential inadequacy. The obviousness that he had clearly slept with me despite not being attracted to me made me feel nauseated. That I had been duped by someone who had the emotional maturity of a mouldy dishrag. I searched for the words to sum up my response. I needed to reply perfectly, for it to be entirely clear how I would process this nugget of information dropped into my lap first thing in the morning. And of course, I wanted him to have a moment of reflection on the fact that he was quite obviously a humongous douchebag. We're conditioned to believe that rejection is a terrible thing, that we should weep into a tub of ice cream, nurse our inadequacies and call upon every available girlfriend to soothe our broken spirits. Realistically, though, the only thing rejection does is take us away from a situation where we don't really belong. Rejection gives us the freedom to continue on our path, unencumbered by things we simply do not need. As hard as it might be to accept at the time, every rejection moves you further away from things that are useless to you. Never give up your power. Rejection is only a judgment if you allow it to be.